The Tracy Anderson Diet is from a former professional dancer who is now a fitness trainer to celebrities including Gwyneth Paltrow, Courteney Cox and Shakira. In her book, Tracy Anderson’s 30-Day Method, she outlines a complete diet and fitness program that she says will enable you to achieve your perfect dancer’s body in only one month. Anderson says that most exercises incorrectly focus on the larger muscle groups such as the biceps or hamstrings, which can cause a bulky physique. Her method concentrates on the smaller accessory muscles and this results in the creation of the long, lean look of a dancer. The diet component of the 30-Day Method is designed to support maximum fat burning and muscle redesign. For the first 25 days of the plan you follow what Anderson refers to as the ‘Lifestyle Menus’, described as “delicious, easy-to-prepare foods that will work perfectly with even the busiest of schedules”. The Lifestyle Menus are relatively low in carbohydrates and exclude grains and starchy vegetables. Healthy desserts are included in moderation and are primarily based on fresh fruits. There is also a separate menu provided for vegetarians. The final five days of the Tracy Anderson Diet involves the Cleanse Menu, which helps you to rapidly lose weight without relying on powders or supplements. The Tracy Anderson Method says that you can expect to lose five to nine pounds in a week with the cleanse. The recipes are all based on real foods with a high amount of fresh fruit, vegetables and lean protein. Portion sizes are not controlled so you may eat freely within the guidelines of the food suggestions. However, The Tracy Anderson Method says that the menus are designed to give you enough nutrition and calories so for best results you should try to follow them unless you are truly hungry. After you have done the 30-Day Kick Start, if you have achieved your goals, you will be able to eat more liberally so long as you keep up with your muscular workouts. Eventually this way of eating will become an unconscious habit, which will support you to maintain your new dancer’s body physique. Fruit, vegetables, kefir yogurt, turkey, chicken, eggs, salmon, cod, shrimp, avocado, endamame, tofu, low-salt feta cheese, pumpkin seeds, chestnuts, garbanzo beans, red beans, quinoa, Dijon mustard, balsamic vinegar, olive oil spray, semisweet chocolate chips, yacon syrup. The fitness component is the foundation of this The Tracy Anderson Diet Method and involves a combination of Anderson’s unique muscle-toning exercises as well as a cardio routine. The book includes illustrations of the exercises and an accompanying DVD. The toning workouts involve three sequences that are followed for ten days each. As you progress through the 30-day program the workouts progressively increase in intensity and variety. The muscular workouts will take about 20-45 minutes to perform, depending on your fitness level, and are to be done every day. The cardio routine involves dance aerobics and is performed for 20-60 minutes. Aerobic exercise is an essential element of this Dancer’s body program and should ideally be done every day. You should aim to work up a sweat because sweating leads to weight loss and has intense detoxifying benefits. The Anderson Method says she normally doesn’t recommend exercise every day but that the kick-start program is different. Even though you may feel sore and uncomfortable you must be committed if you want to get fast results. 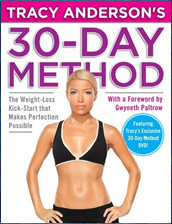 Tracy Anderson’s 30-Day Method retails at $25.99. ‘Boot-camp’ method can produce rapid results. Can help to create the body of a dancer. Encourages a high intake of fresh fruit, vegetables and lean protein. Includes an exercise DVD with demonstrations of the muscular exercises and two cardio dance routines. The Dancer’s Diet is very restrictive and eliminates a variety of foods. Exercise must be performed every day for at least 45 minutes and preferably up to 1-½ hours. Encourages a quick-fix approach to weight loss. Tracy Anderson Diet: 30-Day Method is an intense ‘boot-camp’ style weight loss program that is designed to produce rapid results. It will appeal to highly motivated dieters who want to kick-start a weight loss program or get in shape for a special event. The Tracy Anderson Method will also help people who want to achieve a dancer’s body physique.